Home / Anarchism / After #RoteFlora, #NoG20 & #CologneForAfrin Demos in #Germany: How can we Respond to The Authoritarian State? After #RoteFlora, #NoG20 & #CologneForAfrin Demos in #Germany: How can we Respond to The Authoritarian State? On January 27, 2018 a demonstration against the aggression of the Turkish army was stopped and dissolved by riot cops in Cologne, Germany. Until the cops dissolved the demo it was a peaceful demonstration in solidarity with Rojava, but it wasn’t the first time the cops used the endless list of terms that was imposed to organizers of a registered demonstration, to attack and dissolve a demonstration of anarchists and/or the radical left. This brings up the question; How can we respond to the authoritarian state? Video: On December 21, 2013 riot cops stopped a demo in solidarity with the Rote Flora squat in Hamburg, Germany, after about 100 meters. The Rote Flora demo started to march and was stopped after about 100 meters (videoabove). But people were prepared. The cops faced heavy resistance on Schulterblatt and soon after that people split up in many groups and started with the so-called “out of control” concept. Many groups started spontaneous demonstrations with different routes and different tactics. Anti-gentrification groups were marching peacefully, some of them making music, others attacked cops, banks and corporations and again and again build small barricades which were often not defended but build up to make it difficult for the cops to move around with their vans and water canons. The strategy by the cops to prevent the demo from marching ended in a disaster for the state. 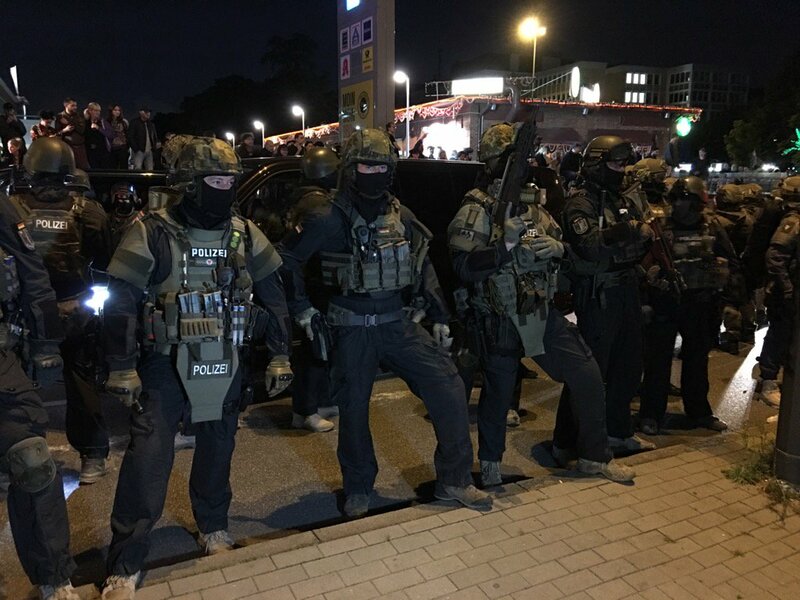 Another example of cops using the endless list of terms that was imposed to organizers of a registered demonstration in order to try to legitimatize an attack on a demo in Germany was the attack of the Welcome to Hell demo on July 6, 2017, during the NoG20 protests in Hamburg. This time the demo didn’t even start marching. In the week before the demo cops violently attacked protest camps, even camps that were allowed by court. The authoritarian state didn’t even bother about their own court rulings anymore. Hamburg police attack Welcome to Hell march Part 1 from CrimethInc. Workers’ Collective on Vimeo. Hamburg police attack Welcome to Hell march Part 2 from CrimethInc. Workers’ Collective on Vimeo. Many people got injured during the state attack against the Welcome to Hell demo in Hamburg. But there was also an immediate reaction. Clashes broke out after the attack and the next day the cops lost control over the Schanze district for several hours. The authoritarian state responded with Special police forces with machine guns pointed on journalists and people who live in the Schanze district. In the months after that the authoritarian German state responded with a wave of repression (read the summary at Mpalothia; here). Last Saturday (January 27) was the second time in a few months that the cops stopped a demo in solidarity with Rojava in the German state North Rhine-Westphalia. Like in Düsseldorf a few months earlier, the cops stopped a demo in Cologne because people were carrying Öcalan flags. Activists of the anti-authoritarian block protected families behind a block that was kettled by cops. They formed a chain between the cops and the families. Many people were detained because they were allegedly carrying or spreading Öcalan flags in the demo. After a stalemate that continued for several hours the cops decided to ban and dissolve the demo (which was peaceful when the cops ended the demo) and people returned to the starting point at Ebertplatz in Cologne. Even the closing gathering wasn’t allowed anymore. The cops had cut off the electricity of the stage for the closing gathering. Even the speech a member of German parliament, Katja Kipping of the leftwing party “Die Linke” wasn’t allowed anymore. I wasn’t very interested in her speech, but that’s another subject. Fact is that the cops banned about everything on January 27 in Cologne. In Cologne there were several problems. There was no plan B, even not after the cops already used a similar scenario to prevent a similar demonstration in solidarity with Rojava from marching a few months earlier. Another problem was that organizer NAV-DEM more or less accepted that the cops stopped the demo. In a statement NAV-DEM condemned the action by the cops but they had no scenario for what to do on the streets. The third problem was that there were not many people in the anti-authoritarian block. How can it be that we weren’t able to mobilize more people? It seems that the authoritarian German state decided that bigger anarchist and/or radical left demonstrations are not allowed to march anymore in Germany. There is a clear pattern. So how do we respond to that? Some people are arguing that it doesn’t make sence anymore to organize big demonstrations when the state doesn’t allow us to march. I disagree with that. We can’t just give-in because the German state doesn’t want us to march anymore. The three examples above showed three different answers. From a tactical point of view people gave an interesting answer in Hamburg, in 2013, with the “out of control” concept. The state didn’t allow the Rote Flora demo to march on a route that organizers and authorities agreed upon and people responded with many many sponteanous demonstrations across the city with unknown routes. Some of these spontaneous demonstrations were spontaneously registered when the cops showed up, others were not. The way people responded after cops attacked the Welcome to Hell demo was possible because many activists were in Hamburg for several days during the NoG20 protests. So that reaction doesn’t necessarily fit for a single demonstration. People don’t always have the time to plan an answer for the next day. Having said that, what if people plan possible scenarios upfront? Among the 20.000 people at the demo in Cologne there were many families with children, in cases like this people have to consider safety options when they develope answers against attacks by the state. I don’t think it’s a good idea to escalate demonstrations where many families with children are participating. But that doesn’t mean people can’t respond at all. If we don’t respond people can get disenchanted and might not take the streets again. There are several possible scenario’s people can prepare upfront; A wave of decentralized actions and demonstrations the day after an announced demo was attacked, spontaneous demonstrations in neighbouring cities immediately after such attacks by the state and so on. There is one thing that we shouldn’t do; give in and accept that the state will prevent us from marching on our streets. The next demo that cops will attack will come. Maybe the demo against repression and the formation of the authoritarian state in Hamburg? Let’s use our creativity and fight back! #Nightfall: Friendship & Resistance – Enough is Enough!